"No State shall make any Thing but gold and silver Coin a Tender in Payment of Debts." In 1913 when the Federal Reserve Act was fraudulently pushed through Congress, Congressman Charles Lindbergh stated: "This Act establishes the most gigantic trust on earth....When the President signs this Act, the invisible government by the money power, proven to exist by the Money Trust Investigation, will be legalized....The new law will create inflation whenever the trust wants inflation....From now on, depression will be scientifically created." IS THE FEDERAL RESERVE BANK REALLY "FEDERAL"? IF THIS IS TRUE WHY HAVEN'T I HEARD ABOUT THIS? Congress initially defined a lawful money "dollar" as being and consisting of (at least) 371.25 grains of pure silver. Before 1965 anyone could exchange one paper dollar for one real silver dollar. However, in 1965 the united States' mint stopped minting silver dollars. When this occurred inflation began to skyrocket. Now it takes a whole fist full of paper dollars (i.e., "Federal Reserve Notes") to buy one real silver dollar. It now takes two working parents to support a family and the national debt is accelerating higher and higher. 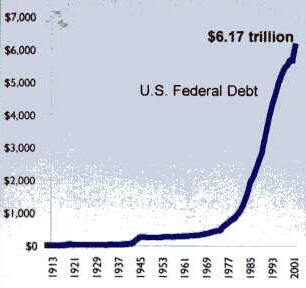 And, of course, the debt of individuals, corporations, cities, counties or states is much, much higher. The paper and digital currency that bankers create out of thin air is backed by nothing. The more paper "dollars" they roll off the printing presses or digital "dollars" created by computers, the less each one is worth. Therefore, it takes more of 'em to buy the things we need, so the price of everything has to go up and up and up in endless inflation. Unfortunately, wages for most people will not increase fast enough to stay ahead of the game. But not to worry, the international banksters have created plastic "credit cards" to help you out (heh, heh, heh). Of course, they don't bother to tell us that they do not create enough paper/digital currency to pay off the debt plus interest so mathematically the economy will eventually collapse as has always occurred in history with paper currencies. Briefly, the Federal Reserve system was created by international banking families such as the Rothschilds, Warburgs and Rockefellers. 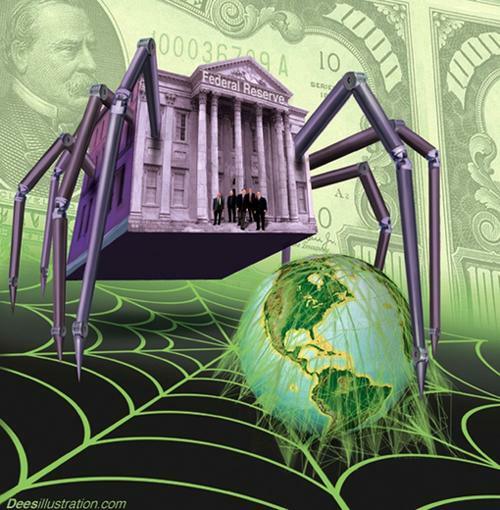 This international banking cartel creates "money" out of thin air. It only costs them a few cents to print each Federal Reserve Note "dollar bill", and then they "bill" the American people for the full face value of the note. Then to add insult to injury, they charge us interest to borrow their so-called "money". If you or I did this, we would be arrested for counterfeiting and fraud. This system was instituted gradually, starting with the Civil War and culminating with the fraudulent passage of the Federal Reserve Act in 1913. The passage of the Federal Reserve Act was unconstitutional because 1) the US Constitution prohibited "bills of credit" (i.e., paper notes) and 2) the US Constitution would have to be amended to go off the silver and gold coin standard for money. The US Constitution, the supreme Law of the Land, can only be amended pursuant to Article V. The US Constitution cannot be amended by statute. These unlawful actions by a criminal Congress remind me of a quote by the honorable Alfred E. Neuman of Mad Magazine fame: "America is that land which fought for freedom and then passed laws to get rid of it." The Federal Reserve is also a monopoly--in a country where monopolies are supposed to be illegal. The IRS deposits people's income tax checks directly in the Federal Reserve banks--not in the united States Treasury. Therefore, the IRS, an unconstitutional entity, is merely the collection agency for the international banksters. Over the years the IRS has become a tool of the elite banking families to financially attack and/or imprison people who expose the Federal Reserve. It is also a tool used by the D.C. elite to attack people who expose government corruption. Banks can create this phony "currency" out of thin air. Banks can loan out "currency" that they don't even have. When you apply for a loan from a bank, the bank does not have anything to back up that loan because they are allowed to loan out about seven to ten times more "currency" than they have on deposit. This is not mere speculation; this is a matter of court record, testimony under Oath, by a former lawyer for the Federal Reserve. In other words bankers create "currency" with just the stroke of a pen or the keystroke of a computer. These bankers then charge you "interest" to borrow this "currency", which is nothing more than some numbers typed on a piece of paper! If We the People ever did this we would be spending many years in a federal prison. Unfortunately, they do not print enough currency to pay the interest so more pseudo-dollars must be borrowed to pay off the interest, resulting in a unpayable, ever-increasing debt. This fraudulent "currency" system benefits not only bankers, but lawyers as well. As has been demonstrated by numerous citizens, government lawyers (members of the Bar Association) serve the Federal Reserve international banksters, not We the People. Prosecutors are co-conspirators with bankers to unlawfully attack and imprison people for bringing up the REAL MONEY issue in court, even though it is the supreme law of the land. The evidence clearly indicates that there is a nationwide criminal conspiracy of bankers and lawyers to overthrow the united States of America. CLICK HERE to learn more about this criminal conspiracy. Article I, Section 10 of the united States' Constitution states: "No State shall...make any Thing but gold and silver Coin a Tender in Payment of Debts." The united States' Constitution is the Supreme Law of the Land and this Law has never been amended. Article I, Section 8 states: "The Congress shall have Power...to coin Money". Notice that it states "coin" not "print". Anyone who reads James Madison's notes of the Constitutional Convention, The Federalist Papers, etc. will find that one of the purposes of the Constitutional Convention was to do away with paper money--entirely! Thus for the first 72 years from the founding of our nation the united States' Government only minted gold and silver COINS for money. The nightmare that Thomas Jefferson predicted became painfully real during the Great Depression when the international banksters caused the foreclosure of untold numbers of homes, farms and businesses. 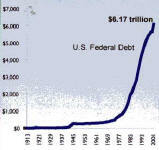 As the national debt moves exponentially upwards, it appears that we are heading for another economic upheaval. CLICK HERE for an update on the economy. MARK OF THE BEAST OR RELIGIOUS MANIPULATION? Anyone can obtain an official letter from the Social Security Administration stating that the IRS has jurisdiction over the Social Security Administration. The IRS is merely a corporation used to turn over the labor and possessions of Americans to the international bankers who own the Federal Reserve. The corporation known as the Social Security Administration is not even based in Washington, DC. It is based in Baltimore, Maryland and it does not even have government franking privileges. Currently, in the United States you cannot get a job, bank account, insurance, driver's license, hunting or fishing license without a Social Security Number. In other words, you cannot make a living, travel, buy or sell without this number. Chapter 13 of Revelations states that the Mark of the Beast is a number without which one cannot buy or sell. Is this the "mark of the beast" or religious manipulation on the part of the powers that be? During the Constitutional Convention the delegates used the words "emit bills of credit" to refer to the issuance of paper (debt-based) currency. The framers of the Constitution were so adamant about prohibiting the printing of paper currency that one of the delegates, George Reed of Delaware, exclaimed that if they put the words "emit bills of credit" in the Constitution it would be "as alarming as the mark of the beast in Revelation!" CLICK HERE for more information on this subject in the article entitled "Mark of the Beast by the American Bar Association?" 1. GET EDUCATED: The first thing anyone can do and should do is to educate oneself on the subject. The book ECONOMIC SOLUTIONS is a good place to start. Another source is A PLEA FOR THE CONSTITUTION OF THE UNITED STATES by George Bancroft. Another highly-recommended book on the subject of the Federal Reserve is THE CREATURE FROM JEKYLL ISLAND by G. Edward Griffin. 2. There are some great videos that educate people about the Federal Reserve Fraud and the international bankers plan for a cashless society. Many people today would rather watch a movie than read a book. CLICK HERE for free video documentation of the Federal Reserve Fraud and other related subjects. "There is no law that says goods and services must be paid for with Federal Reserve notes. Parties entering into a transaction can establish any medium of exchange that is agreed upon." 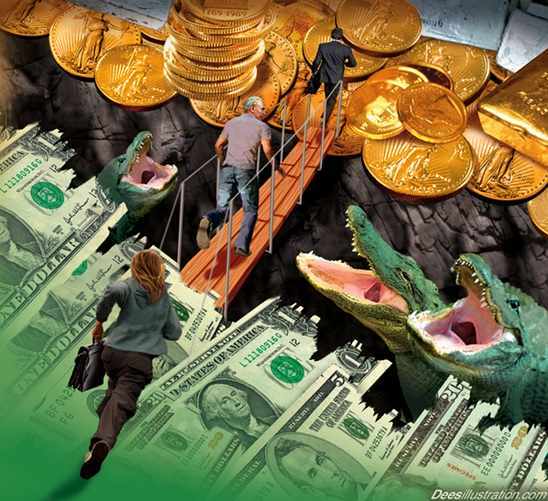 FINANCIAL HEALTH OF THE NATION (PART TWO): Is there Gold in Fort Knox?